A smiling jester could really get you laughing in Triple Jokers, a massively volatile 3 reel, 5 payline slot from Pragmatic Play. Top of the bill here are the stacked wild spin until you win respins which become active every time you fill a reel with joker symbols. 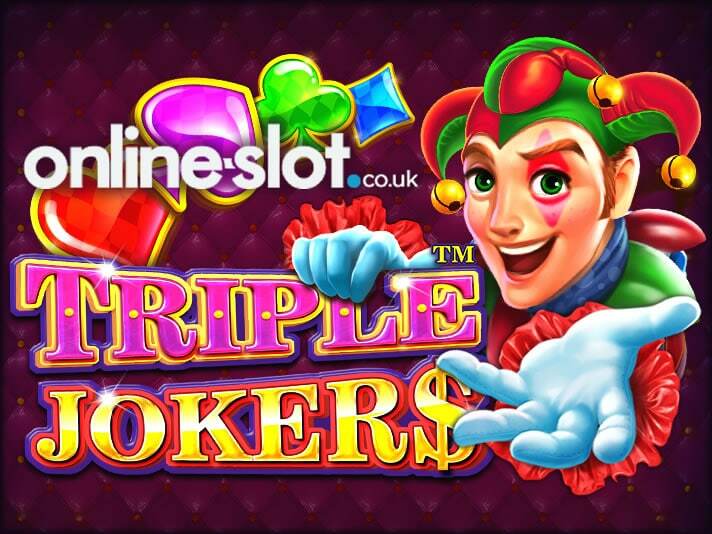 Play on your PC, tablet or mobile from between 5p and £25 per spin. There’s nothing very complicated about Triple Jokers. That’s true of both the design and gameplay. The plain reels have the look of an old-school one armed bandit. There you’ll find lower value diamond, club, heart and spade symbols. More rewarding are the Bar bells and lucky 7s which award 10, 20 or 40 times your total stake if you manage to land a 3 in a row combination. Top of the payers is the smiling joker. Land 3 of these in combination and an award of 60 times your stake awaits. Triple Jokers comes with just a single feature but it has the potential to be a cracker. Respin Until You Win feature – fill all 3 positions in a reel with the joker symbol to trigger this round. The jokers turn into wilds and lock in position. The reels then keep on spinning until a winning combination is created. If you land another stack of jokers, they too turn wild and lock in position. The payouts awarded from 3 jokers increase in the feature too. A 3 on a payline combination awards 200 times your stake rather than the 60 times stake offered in the base game. If you’re lucky enough to fill all 3 reels with stacked wilds, you’ll win a payout of some 1,000 times your stake. The simple design and straightforward gameplay combine to make Triple Jokers a very playable slot, especially if you like volatile action. The variance here is extremely high and you could see your coins quickly disappear. If the joker works his magic though then there are some potentially big rewards on offer. If you’re looking for a slot where you can nurse a limited bankroll for a long spell, then Triple Jokers probably isn’t for you. If you’re after straightforward high risk, high reward play then that’s just what’s on offer in Triple Jokers. If you want bonus features and more thrills, Pragmatic Play has plenty of options with The Dog House my pick.